Throughout the years, Alfred Music and Myklas Music Press have published solos for the Halloween season that have become favorites of both students and teachers. The pieces included in this series represent the most popular and effective solos drawn from the catalogues of both companies. Divided into four graded collections, outstanding works are included by Sharon Aaronson, Dennis Alexander, Christine H. Barden, Melody Bober, Anne Shannon Demarest, W. T. Skye Garcia, Mary Hauber, Bernadine Johnson, David Karp, Martha Mier, June Montgomery, Joyce Schatz Pease, Ruth Perdew, John Robert Poe, Catherine Rollin, Mary K. Sallee, George Peter Tingley, Robert D. Vandall, and Kim Williams. 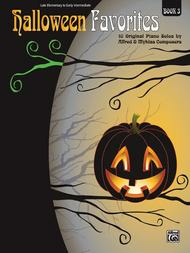 Book 3 includes pieces appropriate for late elementary to early intermediate students. Challenges include pedaling more frequently than at the earlier levels; varying articulation; reading D minor, G minor, and C minor key signatures; balancing a left-hand melody against a right-hand accompaniment; and moving with ease around the keyboard. Titles: Spooky Footsteps * It's a Scary Night! * Mountain Ghost Town * Halloween Hoedown * Witches' Brew * Halloween Night * Grumpy Old Witch * Halloween Dance * Creepy Footsteps * Skeleton Dance!